Claro performs best when your browser's zoom settings are set to 100%. With some browsers, if your zoom setting is zoomed in (e.g., 110%) then the menu bars and other elements will appear out of place when you log into Claro. We recommend setting your browser zoom to the default of 100% to experience the best performance. 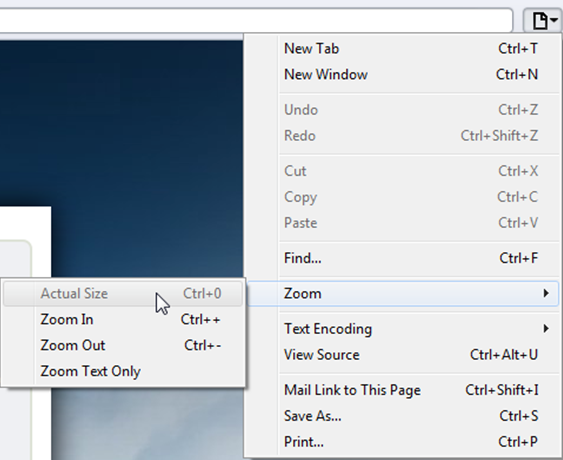 The quickest way to return your browser to the original zoom setting is to press [Ctrl] + 0 (Mac users can use [Cmd] + 0). Additional browser-specific instructions are detailed below. Click the Customize & Control icon . Click the Gear icon in the upper right corner. Select Zoom, and then select 100%. 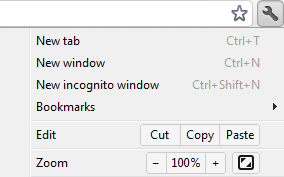 Press the [Alt] key to temporarily bring up the Firefox menus. Click View , and then click Zoom. Select Zoom, and then select Actual Size. See also: How do I zoom my browser in and out to see better?